Small caps are enjoying their biggest one-day jump in more than a month on Monday and the Russell 2000 posts strong gains. But small-cap managers and strategists view the move with caution. NEW YORK (TheStreet) -- Small caps were enjoying their biggest one-day jump in more than a month on Monday, as the Russell 2000 soared more than 2% supporting new records for the S&P 500 and Dow Jones Industrial Average. But small-cap managers and strategists were viewing the move with caution. Greywolf Execution chief technical analyst, Mark Newton, noted that only 26% of stocks in the Russell 2000 were above their 50-day moving average compared to 59% of stocks for the S&P 500. "We still don't have the breadth needed to support the start of a big rally," he said. 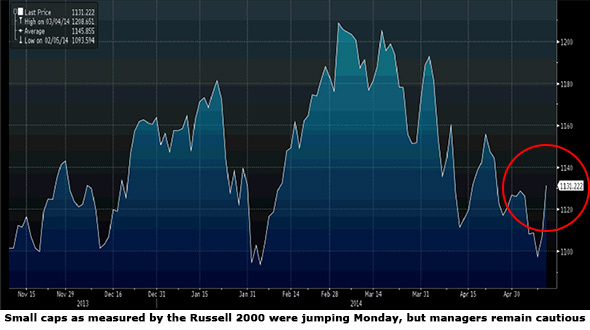 In addition, only 45% of Russell 2000 stocks were above their 200-day moving average, which means the index is unlikely to touch new highs anytime soon, he added. Chase Investment Council chief investment officer Edward Painvin and Motley Fool senior analyst Bill Mann still see small caps as expensive relative to their larger cap peers. "We're very cautious on valuations," Mann said in a phone interview. Painvin agreed, and said despite the pullback in small caps this year -- the Russell 2000 has fallen more than 6% from its March highs -- he preferred their larger more liquid peers in the S&P 500. Small caps have suffered this year due to their heavier weighing toward biotech and technology stocks, which were sold off after running hard in 2013 as managers shun momentum plays for value names. Solid performance from the Russell 2000 is seen as crucial if broader markets are to push higher, with support for small companies viewed as a gauge of investor risk appetite. Many fund managers still believe small caps will finish the year higher -- albeit behind the broader index -- given investors have few other alternatives for their cash in a rising rate environment. They advocate focusing on small companies with a history of solid earnings growth rather than "blue sky" names with high valuations. Top gainers in the Russell 2000 on Monday included cancer-focused pharmaceutical company Tesaro (TSROup 18.50%, building products distributor BlueLinx (BXC - Get Report) up 18% and Accelerate Diagnostics (AXDX - Get Report)which was gaining 13.44%. Other strong performers were Sterling Construction (STRL - Get Report) and Depomed (DEPO.